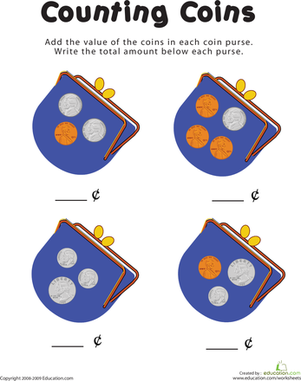 Let your first grader flex his financial savvy with this fun worksheet. 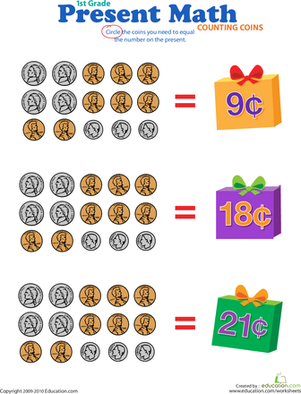 Your child must circle the coins that add up to the value of each present. 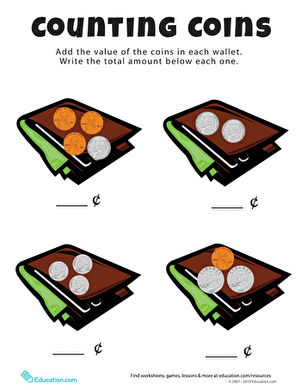 Remind him that there are several ways to make the same amount of change. For an extra challenge, see if he can find them all! 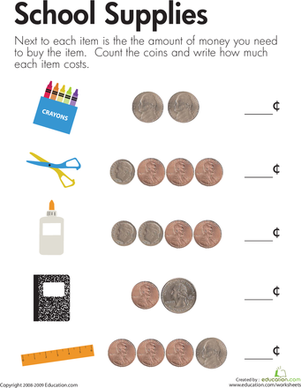 In this first grade math worksheet, your child will circle the coins needed to purchase each item. 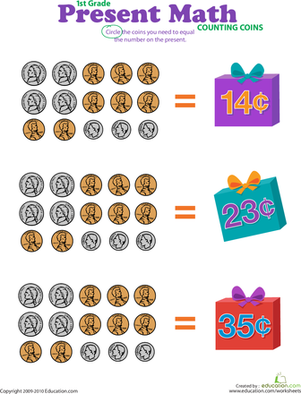 This exercise teaches coin recognition and addition. 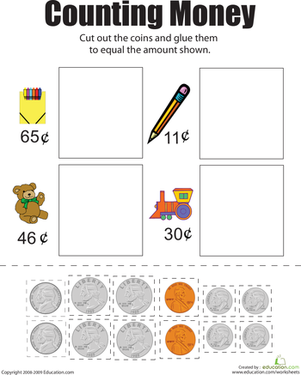 Teach your first grader about money with this simple counting worksheet. 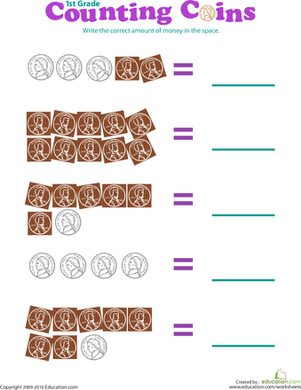 Your child will count each group of coins, then write their total value on the line. 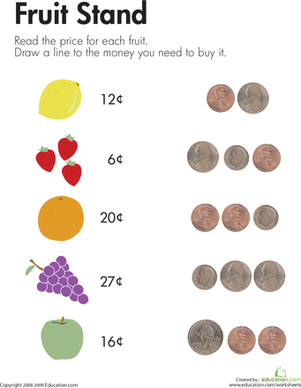 A day at the farmers market is not just good for nutrition; it's also good for math skills. 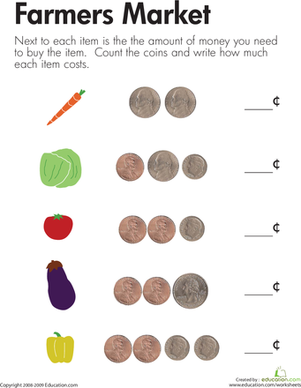 Kids see vegetables and sets of coins representing price. This worksheet has school supplies and math practice. Kids see key supplies for school, and groups of coins representing price. 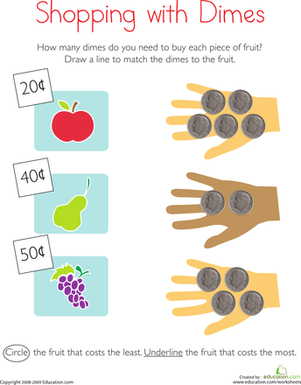 To shop for fruit, kids read prices, count dimes, and match the prices to the equivalent amount of dimes on this first grade math worksheet. 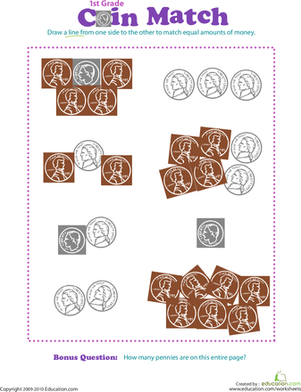 Help kids learn to identify different kinds of coins, and practice counting and shapes too, with this worksheet. Catch the coins before they roll away.